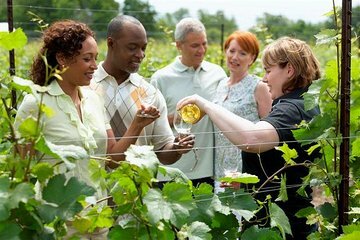 Entdecken Sie Niagara-on-the-Lake, den Geburtsort von Ontarios moderner Weinindustrie, bei dieser geführten 3,5-stündigen Weinprobe-Tour in kleiner Gruppe. Probieren Sie die große Auswahl an Weinen der Weltklasse, darunter den berühmten Eiswein Ontarios mit Käse aus der Region und lokale Konserven, bei dieser Tour durch die besten Weingüter der Region. Erhalten Sie außerdem einen umfassenden Blick hinter die Kulissen eines der Weingüter. Abholung vom und Abholung von den Niagarafällen und Niagara-on-the-Lake Unterkünften sind inklusive. Excellent small group tour, First class guide who took us to some real gems and catered for our needs, slipping in a stop off at a brewery for good measure once she knew that was also of interest, great value a good way to spend the day. The driver was very nice. He did try to pick us up early around 11:30 however we had gone across the street to eat. He left the message to our room at 11:27am. Per your instructions we were waiting for him at 12 in the lobby as requested. Being from the US, my phone for some reason did not want to take your calls and was very difficult to get your calls to ring through. This was a problem on my end. Another bit of feedback is that we arranged to be driven to and from the hotel which if I would have known that that added 2 additional wineries with a 1 hour wait at the previous one for another couple to join us all others were very nice on the trip I probably would have found alternative transportation. Although for your more traditional passengers 6 wineries may be great with me it was a bit much. Also, I found that going to the wineries was kind of chaotic like they were not sure where to put us. There was not really enough room for us to be around. It was a unique experience for sure. This was a very nice tour. It was the first wine tasting my husband and I did together in Canada. We were in a small group with four other wonderful people. Small groups are the best! Our tour guide, Paul, was fantastic. He was very knowledgeable and told us many interesting things. He even took my husband and I to the chocolate factory after the tour. The only downside was that we booked this tour, thinking there would be a hotel pick up. My husband has mobility challenges and we had to pay extra to get picked up and dropped off at our hotel. It was our one year anniversary and this was a little stressful. Excellent tour. Exceeded my expectations. This was a truly awesome experience. Carrie, our tour guide was both friendly and knowledgeable about the wineries and the products that they offered. She kept us organized and the experience was so personal. I thought that we were going on tour with a big group, perhaps on a large tour bus but I was pleasantly surprised that we had our own private tour. We were the only group with our guide. What a treat! Great value for money and THE BEST GUIDE EVER!!!!!!! Thanks Carrie. We went to four wineries and each one had such great wine. The tour at one of the wineries was so interesting, and it was fun to learn the proper way of tasting wine. Our driver Mary Ann was so friendly and sweet - we had a wonderful time with her! Really enjoyed the afternoon. Our guide was informative and helpful. What an amazing time and wonderful tour guide! Our tour guide was friendly and organized. Between the line was absolutely amazing!